It's a long step on the evolutionary ladder from laying eggs to having live babies, and snakes hit several rungs in between. Reproduction and maternal care vary greatly among the snakes that live and breed in the wild in the United States, even among the recent immigrants. Reptiles in general are egg-layers. This is true of snakes. Snake eggs aren't hard like bird eggs; they're leathery. A snake egg stretches to contain and protect the baby inside until the yolk is absorbed and the little snake is ready to survive on its own. The United States is home to more than 200 species of snakes, and most of them lay eggs. Among these are the many kinds of king snake and the rat snakes. 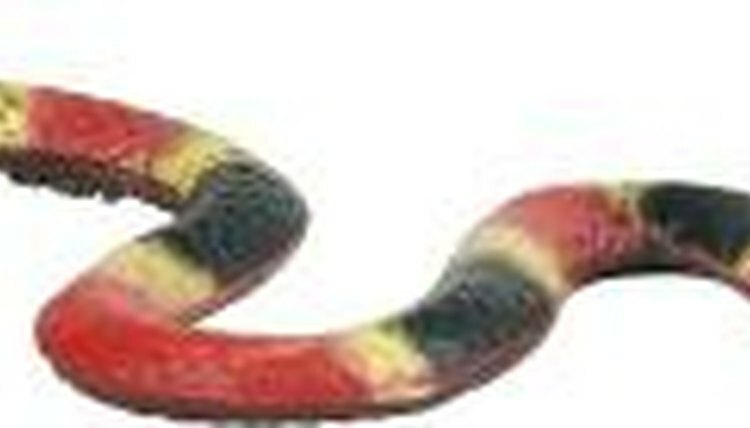 Of the four venomous snakes native to the United States, only the coral snake is an egg-layer. The other three, rattlesnake, copperhead and water moccasin, are pit vipers -- and vipers don't lay eggs. The largest snake found in the United States, the non-native Burmese python, is an egg-layer. Any snake that pops out live babies instead of eggs can be called live-bearing, but it's not live birth in a standard sense. In most cases of what appears to be a snake giving live birth, the female snake has actually held her eggs inside her body until they hatched, then pushed the babies out into the cold, cruel world. Holding the embryos as they develop to live babies inside her keeps them warm and safe from predators. But it's hard on Mom because she can't hunt for food as well, eat as much -- her belly's full of young'uns -- or move as fast to avoid becoming victim herself. Any baby grown inside its mother's body must be nurtured through a direct connection to the mother. In mammals, this connection is the placenta. But in snakes that form eggs but don't lay them, the connection is made in different ways, including the fetal membrane found inside the thinner shell of the retained eggs. The babies stay in the eggs and live mostly on the egg contents. The eggs eventually hatch inside the mother ,and the babies emerge from her body as live young. This is certainly not egg-laying, but neither is it true live birth -- the technical term for it is "ovoviviparous" -- and it's the standard reproductive process in many snakes, from harmless garter snakes to venomous rattlesnakes and water moccasins. Most egg-laying snakes usually find a nice warm, damp, dark spot to "stop and drop," and then move on, leaving offspring to fend for themselves. The python, including the imported Burmese now living and breeding in Florida, actually incubates her eggs by curling around them and raising her body temperature through muscle contractions. Live-bearing snakes frequently abandon their young soon after birth, but some rattlesnakes are known to hang around for a few days to discourage predators from messing with hatchlings. ExoticPetVet.net: Reptiles: Reproduction "From Egg to Adult"
Double D Reptiles: Babies and Birth – Eggs or Live? Do Snakes Need Mates to Lay an Egg?